Hello everyone. 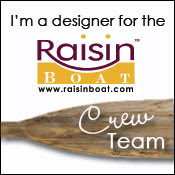 Today's card is for the monthly Raisin Boat Challenge. This months theme is Birthday! 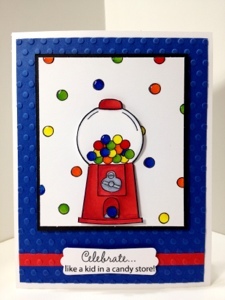 My card was created from the sweet treats set. I used the gum all machine which is just so cute. I colored I with my Copics and cut it out. I added diamond glaze to the gum balls to make them shiny. I also stamped the single gum all to make a cute little background. karen, this is such a cute card! Love it! 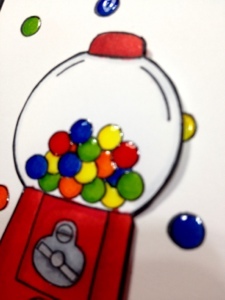 You did such a great job on this card - they look like real gumballs. Great job on the shine and dimension!